Santino V is now a Scottsdale Signature Stallion! Great news! You can now bid on Santino V at the 2017 Scottsdale Signature Stallion Auction. The Scottsdale Arabian show will be held February 16 - 26, 2017. Bidding for Santino V can be done at the show. The live auction will be held on February 22nd at 6:00pm. The winning bidder will receive a breeding to Santino V. The resulting foal will be eligible to compete in the Auction classes which are limited to only foals produced from winning bidders. The Auction classes offer huge payouts to the winners. Over $28,000. to the champion in the yearling classes! I thought what I'd like to do every now and then, is a section called SPOTLIGHT ON: I wanted to talk about and share with you horses who are in the pedigrees of my own horses. Some you may be familiar with, others maybe not. I think this will be fun! Please tell me what you think. If you have a request on a specific horse in one of my pedigrees you'd like to know more about, let me know. I'd love to hear from you. The first horse I'll be Spotlighting is *Jullyen El Jamaal. Here at ParkWest we have three horses who are by *Jullyen El Jamaal; Stardust V, Illuminated, and Incandescence pwa. 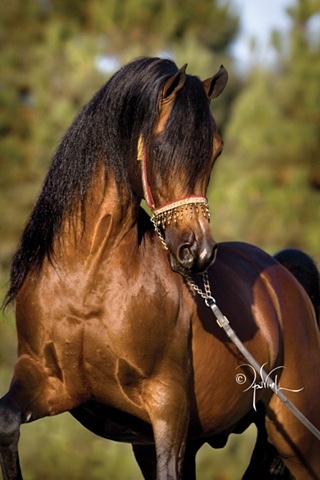 *Jullyen El Jamaal is noted as the top siring son of multiple National Champion Stallion Ali Jamaal. His record as a sire is phenomenal, with National Champion get in halter in North America, Brazil, Australia, the Middle East, South Africa and Europe. He has sired 9 National Champions in western pleasure, 6 in hunter pleasure as well as National Champions in western sidesaddle, western trail, english trail, reining and dressage. *Jullyen El Jamaal passed away in 2014. His most significant legacy is not in the show ring but in the breeding barn. 59% of his champion siring sons have National winning get. One son, Always A Jullyen V, had sired 96% champions from his shown get! Like their sire *Jullyen El Jamaal's sons have sired National Champions in halter in multiple countries. They have sired National Champions in western pleasure, working cow horse, hunter pleasure, sport horse under saddle and a British National Ridden Champion. Their winners roster also includes Top Ten winners in western sidesaddle, dressage, country pleasure and sport horse in hand. *Jullyen El Jamaal daughters are among the breed's most prized broodmares. Nearly all of his daughters who have had offspring have produced champions, and 53% of his champion producing daughters have National winning offspring. His daughters have produced National Champions in halter in North America, South America, Europe, and the Middle East. Their children have also excelled in performance, winning National Championships in disciplines as varied as pleasure driving, hunter pleasure and western pleasure. They've also excelled in sport horse completion in working hunter and hunter hack. If you want a versatile, beautiful athlete, breed with a *Jullyen El Jamaal horse!